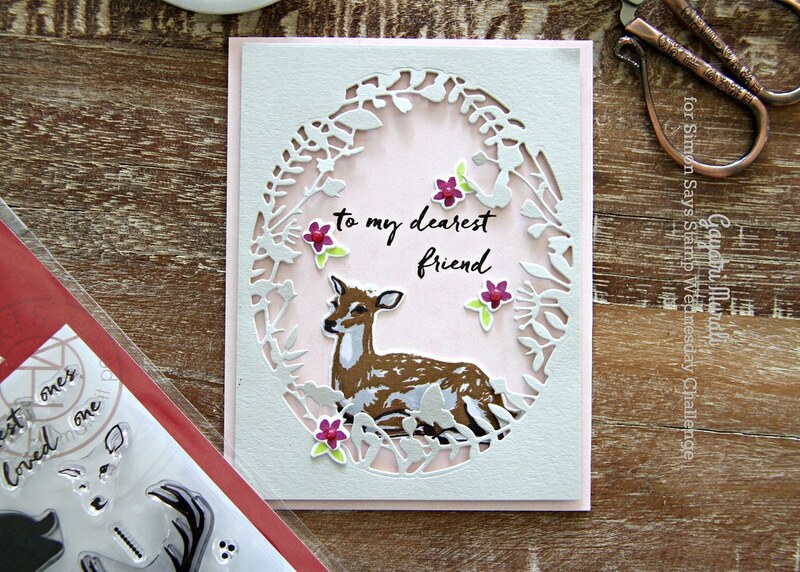 I used Hero Arts Deer stamp set and die from last year’s Christmas release along with their Floral border frame die to create my card for the challenge. I used the Christmas stamp set to make a non christmas card. I love the layered deer image. Looks so real. I stamped them using Simon Says Stamp Fog ink, Hero Arts Soft Granite ink, Altenew Espresso ink and Altenew Jet Black ink. I die cut a fog card panel using the Floral border and frame die adhered on top of a pink card front. Die cut the deer and adhered behind the frame panel. The Deer stamp set also has these cute tiny flower and leaves. I stamped them a few times, die cut them using the coordinating die. 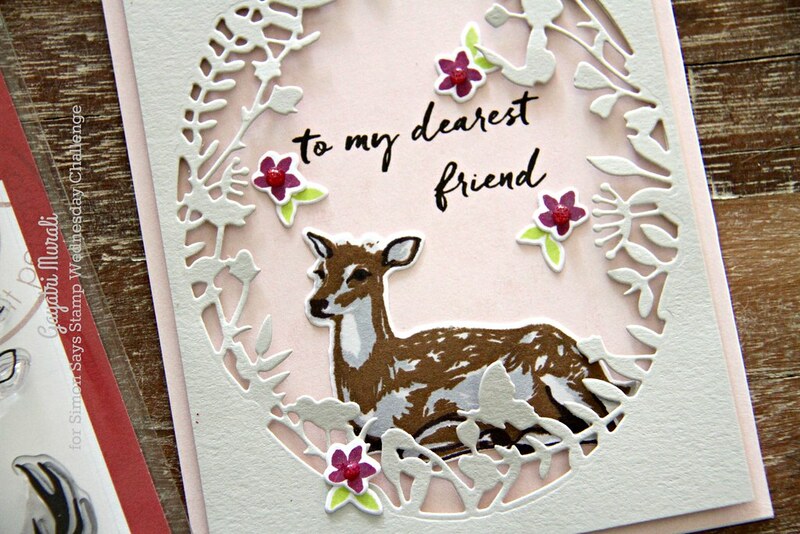 The sentiment is also from the Deer stamp set which I directly stamped on the card front using MISTI. The tiny flowers and leaves are used as embellishments on the card. I used Nuvo crystal drops on the centre of the flowers for added dimension. I DEARLY adore this card!! It is sooooo gorgeous, Gayatri! What a perfect pairing, Gayatri! 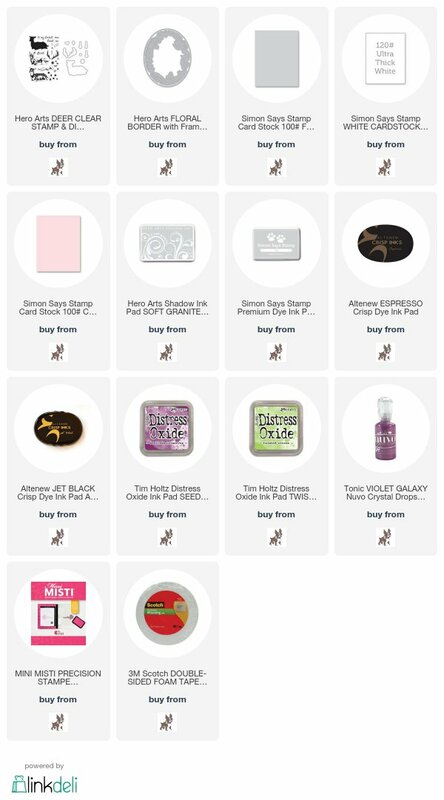 HA’s color layering stamps are the best, and you’ve shown this one off superbly! what a good idea, I love the idea of using stamps in an unusual way. This card is so beautiful and serene. Adorable card Gayatri! Love that sweet deer and that beautiful frame! Great design! !